We're excited to introduce guest blogger Alex Gilliam, director of Public Workshop, who spent part of last summer in search of the perfect see-saw. Read on! 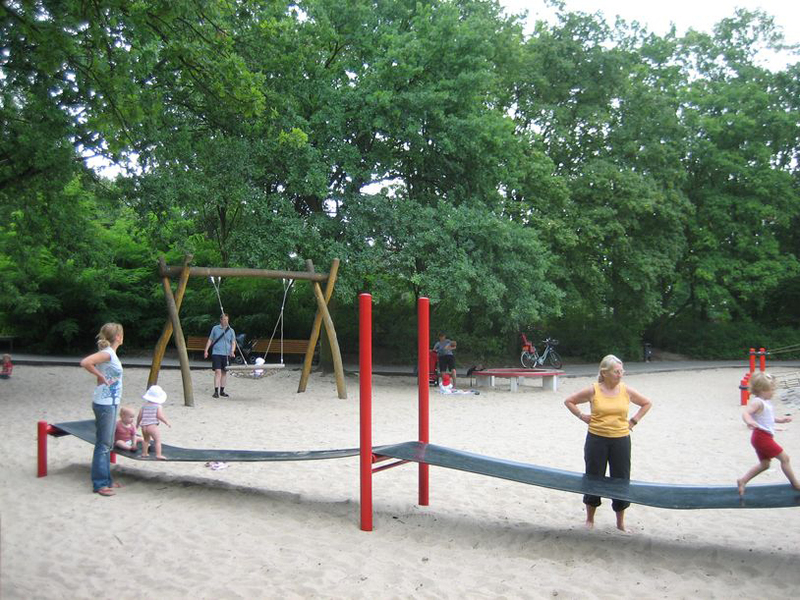 The see-saw is probably one of the most vilified pieces of equipment you will find on a playground. When I started writing this piece, my intention was to show some of the many examples I found last summer, while on a fellowship in Germany, of how designers have tried to make the see-saw safer. Anecdotally, I had heard from a variety of sources, experts and otherwise, that the see-saw is largely to blame for the severed fingers, broken limbs, head injuries and bullying antics that occur on playgrounds—hence, their general disappearance since I was a young lad. I started digging into research so that I could make a particularly strong case for design decisions, such as moving the pivot out of reach of the user. Do you know what I found? Folks, the see-saw (otherwise known as a teeter-totter, ridey horse or hickey horse) wasn’t even among the top four causes of playground injuries. And neither was its even-more-demonized companion, the merry-go-round. In fact, it seems that statistically, most children get injured by simply running into things. This may sound a bit callous, but learning how to not run into things is an important and fundamental survival skill for children and adults alike. So maybe these injuries are largely for the best. 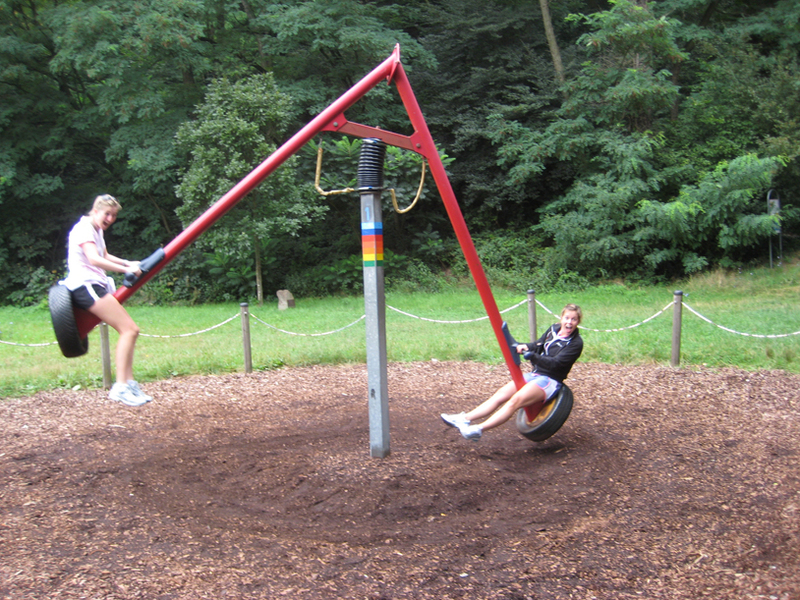 Anyway, regardless of whether the statistics support what formerly sounded like near-see-saw-hysteria, while in Germany last summer I saw a number of great and really pleasing examples of designers trying to make a better teeter-totter. Enjoy. First up, perhaps to avoid the finger severing problem, these designers placed the pivot waaaay out of reach and in fact used a spring to allow teetering. By using acutely angled tubular steel, the designers have also made it remarkably hard to do another favorite see-saw-related activity—standing, walking or climbing on the lever. It’s a little bit harder to bully someone when using the device requires the cooperation of four people. I suppose there are ways around this, but I still like how this piece of equipment allows the users to stand or sit and encourages them to use their entire body to "play." 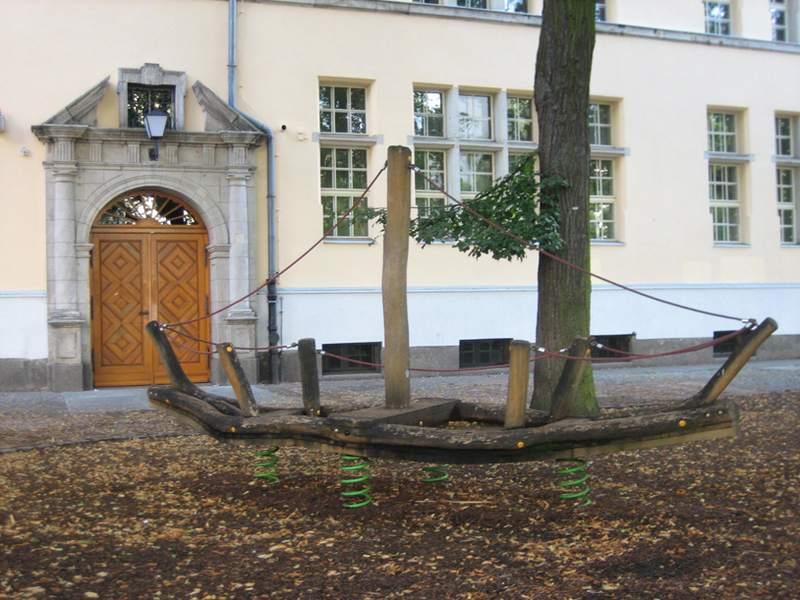 At first I was a bit skeptical of Germany’s overwhelming use of wood and timber in its playgrounds, but it was pretty hard not to be won over by this Viking-boat see-saw. And through the smart use of springs and rope, you can imagine children (or me) actually being able to replicate being on the high seas. Yep, I would have loved, loved, loved this as a kid. What happens when you ask smart designers to eliminate all of the most "dangerous" aspects of a see-saw while challenging them to not only preserve the fun, but triple it? The see-saw-trampoline, of course. 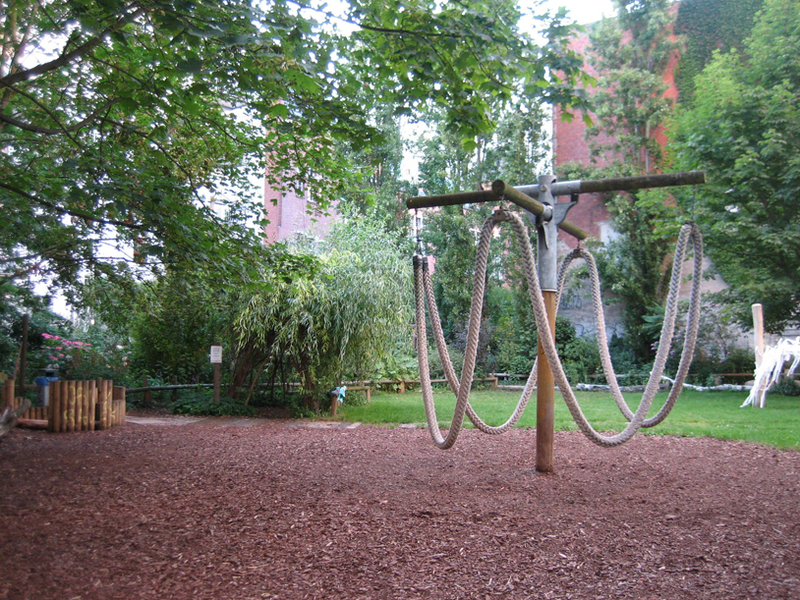 This gem, found on a playground in Kreuzberg in Berlin, is a wonder. Not only did the designers remove the finger-severing pivot and ditch the head-knocking/foot-crunching lever but they have created a piece of play equipment that consistently beckons young and old alike. To learn more and see a photo of a wheelchair see-saw on an "elderly playground" visit the full blog post here. Learn more about Public Workshop,which is dedicated to helping individuals, schools and communities achieve great things through design. Cool playground! From the real world or the pages of a Dr. Seuss book? Wordless Wednesday: Will this increase physical activity on the playground?